Susan Wright is Professor of Educational Anthropology at Aarhus University and Director of the Centre for Higher Education Futures (CHEF). She coordinated the EU project ‘University Reform, Globalisation and Europeanisation’ and the EU ITN project ‘Universities in the Knowledge Economy’ in Europe and the Asia-Pacific Rim. She co-edits (with Penny Welch) the journal LATISS (Learning and Teaching: International Journal of Higher Education in the Social Sciences) and with Cris Shore and Davide Peró published Policy Worlds: Anthropology and the Anatomy of Contemporary Power (2011, Berghahn). Cris Shore is Professor of Social Anthropology at the University of Auckland. He is founding editor of the journal Anthropology in Action, inaugural Director of Auckland University’s Europe Institute and, with Susan Wright, is editor of the Stanford University Press book series, Anthropology of Policy. His recent books include Up Close and Personal: On Peripheral Perspectives and the Production of Anthropological Knowledge, (with Susanna Trnka, 2013, Berghahn). Chapter 2. 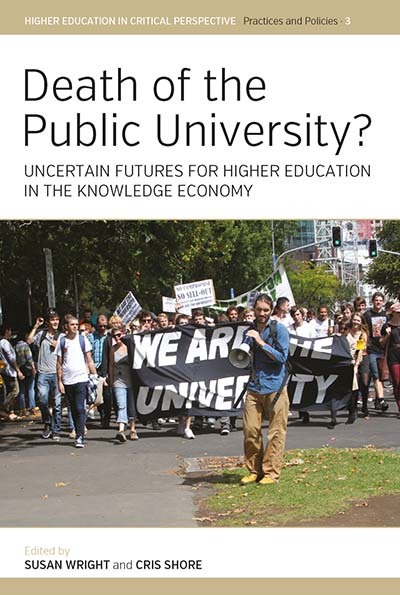 Managing the Third Mission: Reform or Reinvention of the Public University? Chapter 9. The Rise and Rise of the Performance-Based Research Fund?